“Conduct yourself with wisdom in your interactions with outsiders (non-believers), make the most of each opportunity [treating it as something precious]. 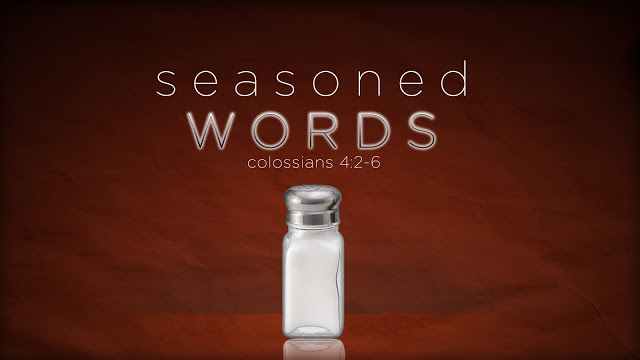 Let your speech at all times be gracious and pleasant, seasoned with salt, so that you will know how to answer each one [who questions you]” ( Colossians 4:6 Amplified Bible). 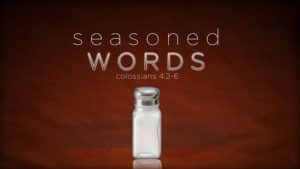 If I could add to this verse, it would include “seasoned with salt and not colorful metaphors or expletives ….” I have read many conversations on social media about how the Bible doesn’t say, “don’t curse,” “don’t swear” and “never defines inappropriate words.” But, do colorful metaphors and expletives flavor our conversations with salt or do they leave a bitter sound in the ears of someone seeking to know a set-apart person who claims to live a holy life? Does it cheapen our testimony of the One who died to change our hearts and rose to give us new life and will return as our Husband and King of Kings? For those who say that the Bible doesn’t define swear or curse words also known as profanity, it doesn’t need to be specific. If the instructions of God are written on our hearts, we will know which words are ‘unclean’ for our lips and it includes more than just speaking the days of the week that are the names of ‘other gods.’ Profanity comes from the word ‘profane’ or chol in Hebrew and means ‘common’. Do we speak as the common people around us or do we speak words that set us apart for the glory of God, bearing fruit for His Kingdom? “Anyone who thinks he is religiously observant but does not control his tongue is deceiving himself, and his observance counts for nothing” (James 1:26). “Let no harmful language come from your mouth, only good words that are helpful in meeting the need, words that will benefit those who hear them” (Ephesians 4:29). My mother worked for a county judge and she hated his foul language. She never cursed or swore with four-letter words or even said, “Oh my God” for she believed that was “taking the Lord’s name in vain.” His colorful language never benefitted her ears nor did it make her job a pleasant one. It was a constant thorn in her heart while she worked for him. I can’t say that my mouth was always as pure as hers, however, I know her influence was profound in my life. I never, I repeat, NEVER, say “O my God” and it breaks my heart to hear it thrown about so freely by everyone today as a common phrase. It may not be ‘taking the Lord’s name in vain’ specifically as ‘God’ isn’t the name of the Creator, but it has cheapened the concept of God as does using “Jesus Christ” spoken as profanity or in anger. The fact that I don’t believe ‘Jesus Christ’ is the actual name of the Savior doesn’t make the curse less offensive or wrong. According to James, the tongue is a powerful part of the human body and where it produces salty water, it cannot also produce fresh water (James 3:12). Salt in this comparison is not the salt of speaking the Word of Truth because the Word of Truth is always compared to living water, springs of life. Salt in this instance is a destroyer of life that leaves a place desolate. Others using colorful metaphors never apologize. These people fall into two categories. The ones who are not followers of Messiah and do not have the Spirit of God convicting them of sin; the others who are followers of Messiah. The non-followers of Messiah, like the county judge, are nothing more than unredeemed sinners. Nothing more can be expected of them. They live in darkness. They do not have a heart of flesh. They have never received the Spirit of God into their lives. The word of Truth to them is foolishness and they are spiritually dead. They are of the world and live like the world that promises no hope. We can never know anyone’s heart and God’s plan for their life, but our speech seasoned with salt is a testimony to Yeshua in our life and may challenge them to ask questions about our faith, our hope and our abundant life in Yeshua. The discouraging ones are those who claim to follow Messiah but do not seem convicted of what comes out of their mouth. Their speech, seasoned with expletives and four-letter words holds the wrong kind of salt, does not encourage anyone, and ultimately destroys their walk because it’s without the talk. It blends into the world and there is no difference between their speech and the unbeliever’s. In fact, for me personally, I am shocked when ‘unclean’ words flow through their lips so easily; it jars my spirit. I knew a woman many years ago whose speech was seasoned with several four-letter-words, some that most people would defend as okay speech. Every time some of those words flowed out of her mouth, I cringed wondering if she actually knew what was her tongue was saying, whether she was remotely convicted, and if she knew how it affected my ears by the shocked look in my eyes. Now I know her daughter and her speech is seasoned with exactly the same words. To be honest, I have used colorful metaphors because I was once part of the world and its ways – read this college and workplaces. When I became a follower of Yeshua, I had to make a conscious decision to watch what came out of my mouth because they flowed so freely I was completely unaware until a godly friend brought it to my attention. I didn’t want to sound like a sailor when I talked because I had become a member of the Kingdom of the Most High God, the Bride of Messiah. In the beginning the struggle was real, but now those words rarely pop into my head and when they do, I am deeply convicted. I also had children to raise. I didn’t want them to learn to talk gutter language; I wanted them to speak intelligent English and have their speech seasoned with salt and the truth of the Word. Unfortunately, each one of them went into the world and those seeds that I believe are firmly rooted, have been choked out by the ways of the college world and the workplace. I am prayerful and hopeful as some have come to the conclusion they want to be more professional in their jobs or hear others speak colorful metaphors and know how slum-dog it sounds. I am prayerful for my grandchildren who should never have to hear colorful metaphors or expletives either. I am not without sin and when a colorful metaphor does slip out of my mouth, I am immediately convicted to consider what darkness I am harboring in my heart that needs to be brought into the light. When being honest with myself, the word either grew from unjustified anger in the moment, a lingering bitterness from a rooted disappointment, stress that I let over take my day, or not having the wherewithal to salt my speech rather than slur my tongue being carelessness about the ears of my Father. In the world today, the use of language has fallen into the gutter even amongst those who claim to be god-fearers, born again members of the Kingdom of God. The pain and suffering among believers that comes out in their speech shows the message of repentance to restorative healing is lacking. Daily stress causes many to cuss and swear for relief not realizing that God desires to give us His shalom, His relief from the stress, pain and suffering through giving Yeshua the burdens we carry. He wants us to forgive others and forgive ourselves for those things that cause anger and bitterness in our hearts. He wants us to turn back to Him with our tongues, with our speech so we are truly set-apart for Him in this world and those who see and hear us speak without colorful metaphors recognize that we are part of “a chosen people, the King’s priesthood, a holy nation, a people for God to possess! Why? In order for [us] to declare the praises of the One who called [us] out of darkness into his wonderful light” (1 Peter 2:9). “May the words of my mouth and the thoughts of my heart be acceptable in your presence, Adonai, my Rock and Redeemer” (Psalm 19:14).